What's a real katana price? (notice we said didn't say "real katanas price" as katana is both the plural and singular form). How Much are these swords? $50? $300? $3000? Can you guess how much the three swords above are worth? Are they real, or do you think they are "fake"? Believe it or not, if you see blades in this plain fit out called "Shirasaya" it is quite possible that they are VERY valuable.. 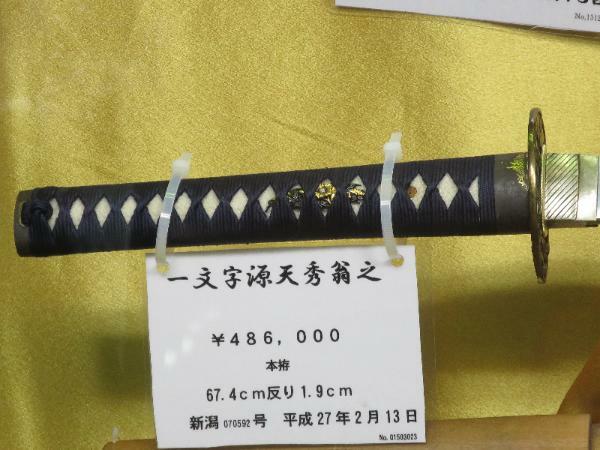 Indeed, the starting real katana price for a bona fide sword made in Japan (called a "Nihonto" or "Shinken", meaning "Japan sword" and "real sword" accordingly) is around US$4,000 - such as the one shown below which was made in 2015 and costs just a tad over $4,000. 486,000 yen or roughly US$4,100. Made Feb 13, 2015. 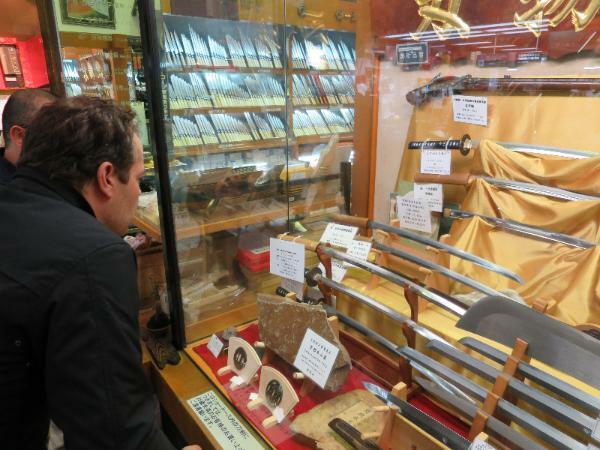 A sword shop in Japan. 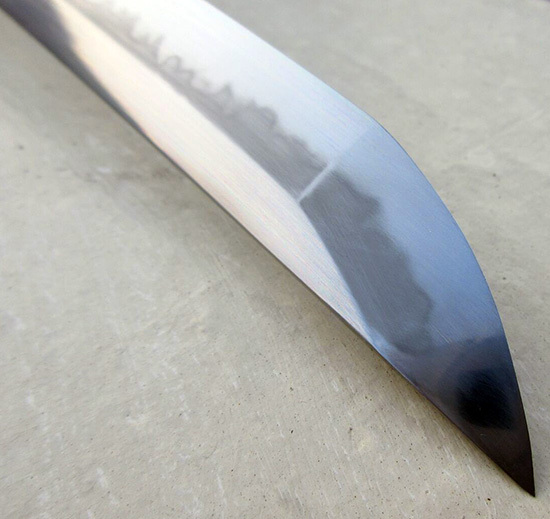 Notice several blades are in "Shirasaya"
Bear in mind that this is the starting price. Bottom one is over 5K, the top one, closer to 10K.. However, let's define what we mean by "real".. Recently made Nihonto. Around $6,200. In the argument of real Katana vs fake, leaving out WHERE they are made and judging them purely on form and function - the reality is that both of these swords are fairly close. 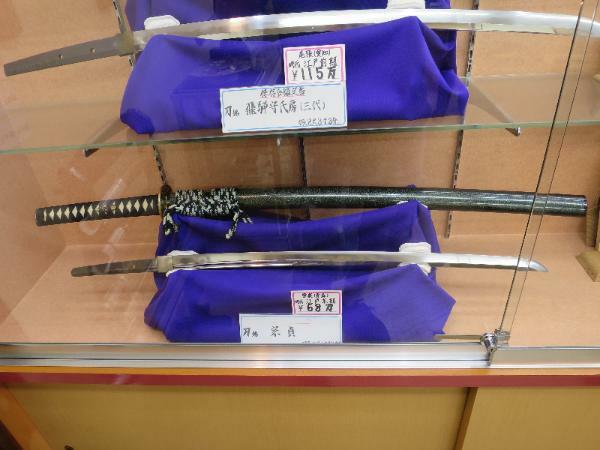 However the real katana price for the Japanese made Nihonto is 10 times that of the Ryujin Katana . Whether or not it is 10 times better is a matter of debate.. Some people think so because there is no doubt that more attention to detail is paid to this blade than the Chinese made one. But for practical purposes, the differences are actually pretty minor.. So back to our original question, how much is the Shirasaya set in the first picture worth? The set in the picture are worth - around US$50 for the lot.. But from the picture alone, even an expert might not know if they were real Nihonto or not.. The only way to know if what you are seeing on the internet is a real katana price or not is the REPUTATION of the company offering it. A trustworthy sword seller is honest about where the swords are made, how they are made, and who makes them..
Bad sellers, not so much.. The worst I have seen is a brand (that will remain unnamed for now) that claims their swords are made in "Seki city Japan" - but we actually found them stored away on a visit to Longquan, China..! They are being sold for $900 but should sell for $200 at best - beware, there are some real sharks out there! So when it comes to Japanese swords, especially high end ones, it pays to do your research. 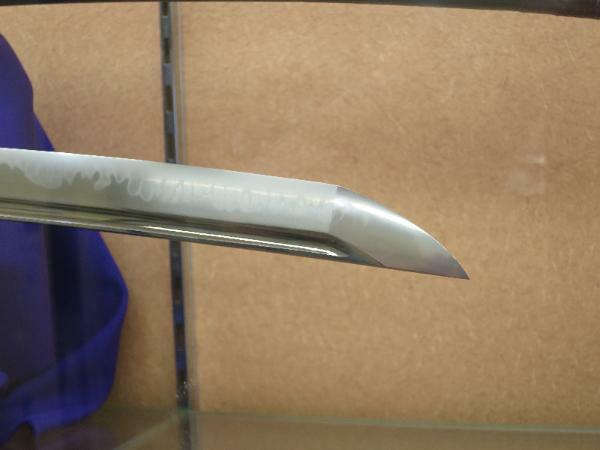 Use SBG, visit sword forums, ask lots of questions, and get to know your brands..
Or of course, just go to Japan with $4-10K and buy there - because according to the purists, that is the real katana price you will need to pay! (though money alone is not always enough, many traditional sellers need to get to know you personally to ensure the sword will be looked after and going to a good home! Yes, they take their swords THAT seriously! )..